Infused with natural clay harvested from the banks of the Amazon River and naturally baked by the sun, this nutrient-rich blush benefits all skin types for a fade-free flawless finish for an amazing 12 hours. Inspired by Tarte’s best-selling shades of cheek stains and lip tints, the colors range from soft to vivid to suit a wide variety of skintones. For oily skin types, Amazonian clay minimizes oil in and around pores to balance skin and keep product in place. Those with dry skin will benefit from the clay’s nourishing and hydrating properties, which naturally restore skin’s moisture. Combination skin types can rely on its ability to zero in on skin concerns and deliver benefits to restore complexion harmony. The result? Blush that wears better, longer, and truer! According to Sephora’s online store, it is formulated without parabens, sulfates, synthetic fragrances, petrochemicals, phthalates, GMOs (genetically modified organism) and triclosan. It also contains Amazonian clay, a nutrient-rich, multitasking, skin-balancing clay that reduces dryness and flakiness, improves skin clarity, elasticity, firmness, and texture while removing oil from the skin’s surface for smooth application and wear. First of all, am I the only one chuckling at this description? “Solar-baked”… haha! I have never tried Tarte products before. In fact, I’ve never even heard of this brand as it is not available in Singapore. I was introduced to Tarte by Meg’s Makeup, and what peaked my interest was the packaging. When I checked out their website, I immediately noticed that most of their products had simple, yet elegant and attractive packaging. I loved the trademark vine design that adorns their website and products. I also like the leafy imprint on the pressed blush. Their website has an information page on Amazonian Clay which is new to me. Seeing photos of the owner slathering what looks like mud on herself is slightly icky, but a very refreshing change. I respect CEOs who are down-to-earth (did you see what I just did there? :P) and are personally involved in what’s happening on the ground (and again! I’m on a roll lol). I really like this blush. The texture is smooth and almost creamy, and it blends really easily. The shade, Blissful, is a warm peach colour that is very flattering. I usually wear only cool colours as warm colours look wrong on me, but Blissful suited me perfectly and gave me that healthy flush on my cheeks. I used a fibre-optic brush (FOB) as the blush was very pigmented. I am slightly tanned, but a gentle swipe of my FOB on the compact picked up enough colour for each cheek, so the fairer ladies need to be really careful or you’ll end up with unnaturally rosy cheeks! I don’t doubt their 12-hour claim, as this lasted at least 10 hours on me without fading or oxidising. 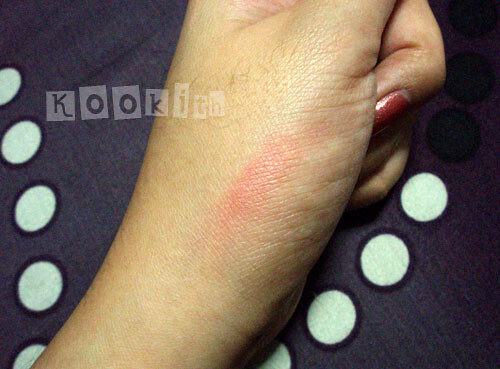 I bring up the issue of oxidation, because that is the crap-test I use on blushes. Blushes which have questionable ingredients, *cough* Everyday Minerals *cough* will turn orange on me within a couple of hours, and I’ve noticed that with cheapo, no-brand blushes from the dollar store as well. 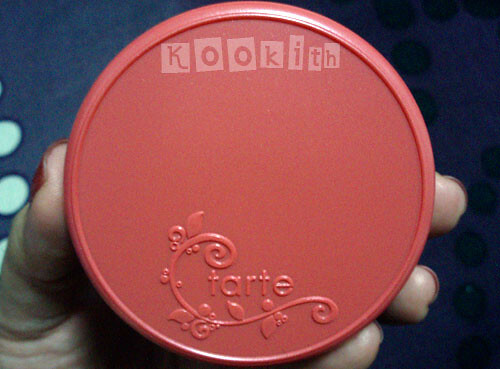 Overall, I am extremely happy with this blush, and I would love to try it in a different colour. 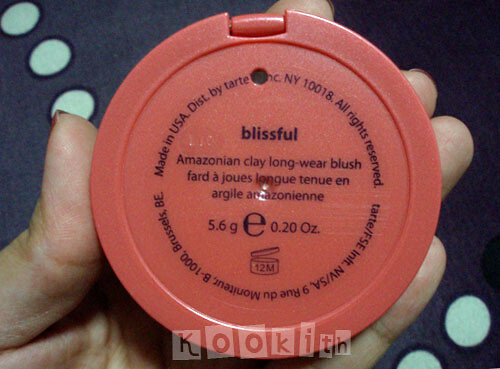 I saw some swatches this blush comes in a bright pink shade (Amused) as well, and that is going straight on my wishlist! Tarte has a section of their website dedicated to what they call “Green Beauty”, which is a concept very close to my heart. I wish more companies would implement a Customer Recycling Incentive Programme, as I really do not like to throw away compacts and jars. With the amount of makeup we buy and trash, I’m sure an initiative like this would make a significant difference to the environment. 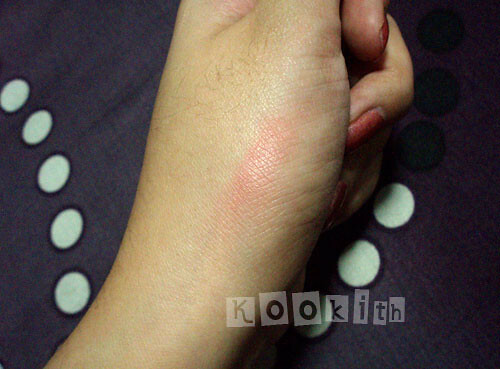 Hi kookith, love your swatches..they are so nice and clear. 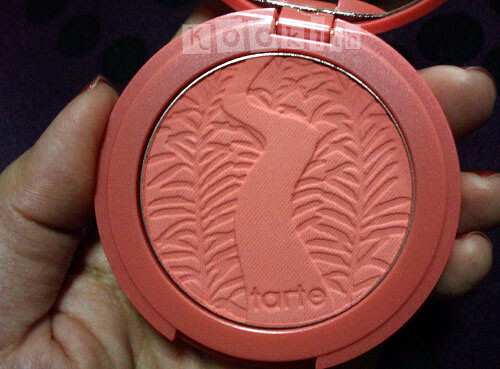 I’m from Singapore too..any idea if Tarte amazonian clay blushes are available at Ion Orchard’s Sephora? I SO want Amused and blissful now! Did u get them overseas or here in SG? Thanks! I’m so embarrassed with the late response! Thank you for the lovely comments 🙂 It is so nice to ‘bump’ into a fellow Singy on the world wide web. I have to admit that I have OCD tendencies, and it irks me to no end when I stumble upon blogs that have dark and blurry photos. Therefore I was adamant to take decent and accurate swatches despite my amateur photography skills! I don’t know if the blushes are available in SG’s Sephora, as I hardly go there (I lose all self-discipline when I’m in there). I do suggest you try the Tarte website, as I think they will probably be very expensive in Singapore. I had gotten this product from Meg’s Makeup… you should check out the site (click on the banner on the top right corner of my blog). You can get free makeup just from commenting and rating different posts! I hope that helps 🙂 Thanks again for stopping by.